What a wonderful alternative to hot dogs in case you’ve run out of them? Sausages, of course! They’re just as festive, but usually not as costly and with a little trick, they can be as beloved by your crowd as well. 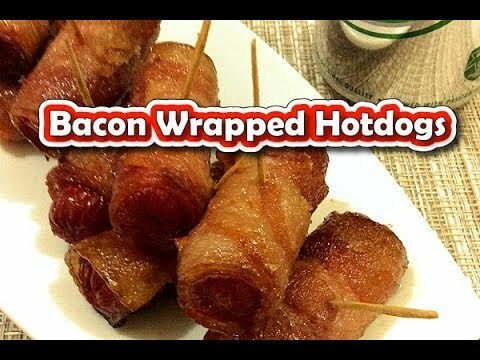 Take the Bacon Wrapped Hotdogs Recipe, for instance. It’s a nice way to give the good old sausage an interesting twist. The bacon grease and sweetness blended with the sausage’s distinct flavor makes this as instant favorite for kids and adults alike. Not to mention that being skewered on toothpicks gives this treat a very attractive appearance. Whether you are cooking for a special birthday party or a dinner for a small family gathering, this recipe is a must-try if you are looking for a delectable appetizer like no other. Sure, it may be a little time-consuming to prepare, but I’m telling you, your friends and family members will go crazy with this food once they get to taste it. It’s something everyone will want to munch on before the big meal so be sure to cook much. Don’t say I didn’t warn you! Line a baking sheet into a pastry baking tray. Using a pair of kitchen scissors, cut the Purefoods bacon into two. Wrap the sausage with the sliced bacon, wrap around each sausage and secure with a toothpick and place on the baking sheet. Repeat with remaining sausages and bacon. Sprinkle brown sugar over each sausage then bake at 325 for 40-45 minutes or until the bacon is starting to brown. When cooked, remove from the oven and place it on a serving plate with your favorite Beer. Bacon-Wrapped Cocktail Sausages Recipe is a great finger food for a birthday party or a dinner for a small family gathering. I’d love to try this recipe, it looks really delicious! Thank you for sharing! i am recommending this! i tried it and it is delicious!!!! My body is asking for it. It is now 1AM. YOLO! This sounds like a whole lot of deliciousness! My family will definitely want me to make these for them! They look delicious! This recipe looks really delicious, I’ll definitely have to try it out. Thanks for posting! That does not look remotely healthy, but who cares! I bet it’s delicious. This sounds so good for football parties or just to snack on. I make these for holidays and never knew it was a Filipino cuisine like the recipe says. These are so good. We make these every Thanksgiving, they are delicious. im trying this at home! thanks for sharing!